Delicate or not, came a time when her father decided that Pinito should contribute to the Segura family show. She was nine years old, and furthermore, she had limited physical skills. José may have noted, however, that his odd daughter had a good sense of balance: he put her on the tight wire. Pinito hated it. She became very self-conscious and was ashamed to perform in front of an audience: She thought her act was not good. But she was not given a choice. Thus Pinito del Oro, the circus performer, was born. Not the star aerialist, though: The family star aerialist, then, was her elder sister, Esther, who had a trapeze act. A few years later, while they were back touring in mainland Spain, one of the circus trucks overturned on a slippery road between Cadiz and Seville, where the Seguras were scheduled to perform at the Feria. Esther was killed in the crash. "The show must go on" may seem a corny cliché, but nowhere does it carry more actuality than in the circus: Pinito had to take her sister’s place as the show aerialist. This was 1943, and she was twelve years old. 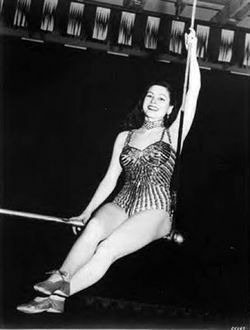 [[File:Pinito_del_Oro_on_trapeze.jpeg|thumb|250px|right|Pinito del Oro (c.1955)]]The Washington trapeze (a trapeze with a heavy, flattened bar on which the artist performs balancing tricks) was an obvious apparatus for Pinito: She was not that strong as an acrobat, but she was a good balancer, and could therefore transfer her skills from the tight wire to the trapeze. Atila, who didn’t want Pinito to become a circus artist, never saw her daughter perform on the apparatus that would make her famous: She suffered from hyperglycemia, and sadly, she died just before Pinito’s debut. From [[H. R. Keyes Washington]] (1838-1882), the creator of the genre, to his later emulators, Washington trapeze had long been presented as a bravado act, emphasizing a sense of imminent danger overcome by triumphant macho daredevils. Pinito del Oro indeed played this suggestion of danger (all-too-real since she was performing without any sort of safety device), but she did so with extraordinary grace, and with a natural, childlike vulnerability that made it impossible for the audience to take their eyes away from her. Although she did all what the male practitioners of the specialty did, and even more, she remained exquisitely feminine and never lost her innate appearance of fragility&mdash;a combination that made her unique. Pinito’s contract with Ringling Bros. kept being renewed, and she continued to be a center-ring feature in lavish aerial ballets, the musical scores of which were signed by John Ringling North. In the winter, she played Shrine Circus dates, and for the 1952 Holiday season, she was featured in [[Tom Arnold]]’s ''Mammoth Christmas Circus'' at the [[Harringay Circus|Harringay]] Arena in London&mdash;one of Europe’s most prestigious winter circus shows. In 1955, she must have felt ''en famille'': Her niece, the very talented somersaulter on the tight wire Atilina Segura, was in the show, along with Pinito’s friend, Miss Mara, and Mara’s brother, [[Tonito]], another exceptionally brilliant tight-wire artist. Pinito’s contract with Ringling Bros. kept being renewed, and she continued to be a center-ring feature in lavish aerial ballets, the musical scores of which were signed by John Ringling North. In the winter, she played dates with [[Polack Bros. Circus]], a leading Shrine Circus producer. For the 1952 Holiday season, she was featured in [[Tom Arnold]]’s ''Mammoth Christmas Circus'' at the [[Harringay Circus|Harringay]] Arena in London&mdash;one of Europe’s most prestigious winter circus shows. In 1955, she must have felt ''en famille'': Her niece, the very talented somersaulter on the tight wire Atilina Segura, was on the Ringling show, along with Pinito’s friend, Miss Mara, and Mara’s brother, [[Tonito]], another exceptionally brilliant tight-wire artist. 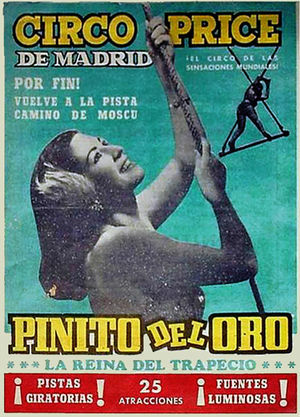 [[File:Pinito_del_Oro_-_Tuefferd.jpeg|thumb|right|300px|Pinito at Cirque Medrano (1958)]]Pinito del Oro had returned to her home country at the right time. She had been invited to participate in the ''Gran Competición Mundial del Circo'', organized in November 1956 at Barcelona’s Palacio Municipal de los Deportes (a sport arena) by Arturo Castilla, in association with Juan Carcellé and Pedro Balañá. Pinito was proclaimed "Reina del Festival" (Festival’s Queen), and many European agents and directors&mdash;a large number of whom had never seen her perform until then&mdash;began to court her. Juan Carcellé had also offered Pinito a contract to work at the illustrious [[Circo Price]], on the Plaza del Rey in Madrid, which he was managing at the time. The appearance of the beautiful and gifted American-made star on the fabled Madrilenian ring was an unmitigated triumph. Pinito’s talent may have blossomed out of her country, but the Spanish audiences instantly reclaimed her, and Pinito del Oro became a household name in Spain. She was subsequently featured at the [[Coliseu dos Recreios]] in Lisbon, Portugal&mdash;another prestigious European venue at the time. Her European career was launched. Juan Carcellé had also offered Pinito a contract to work at the illustrious [[Circo Price (Madrid)|Circo Price]], on the Plaza del Rey in Madrid, which he managed at the time. The appearance of the beautiful and gifted American-made star on the fabled Madrilenian ring was an unmitigated triumph. Pinito’s talent may have blossomed out of her country, but the Spanish audiences instantly reclaimed her, and Pinito del Oro became a household name in Spain. She was subsequently featured at the [[Coliseu dos Recreios]] in Lisbon, Portugal&mdash;another prestigious European venue at the time. Her European career was launched. 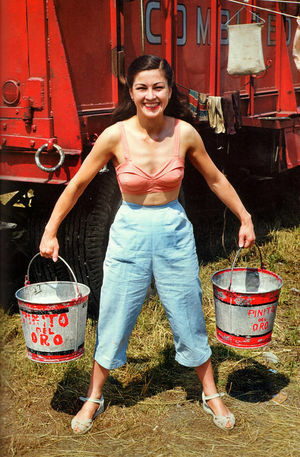 In 1957, Pinito toured in Sweden with [[Cirkus Scott]], that country’s premier circus. On April 29, in Stockholm, she suffered again a very bad fall that sent her to the hospital with another skull fracture, and several fractures to her hands and feet. 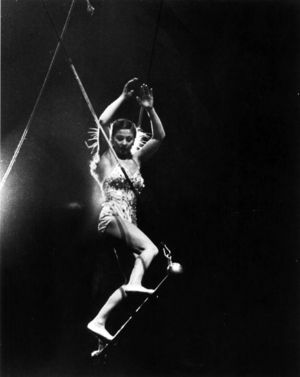 After a quick but intensive period of rehabilitation, during which she also wrote her first book, ''Cuentos del Circo'', the ever-resilient Pinito was back to her trapeze. She spent the 1957-1958 Holiday season at the [[Deutschlandhalle]] in Berlin. In September and October 1958, she appeared at Paris’s [[Cirque Medrano (Paris)|Cirque Medrano]], where the knowledgeable Parisian press praised her without restraint, and Parisian audiences flocked to the legendary circus to see her. After that, like a matador, Pinito cut her ponytail. She retired in Las Palmas, where she has transformed her house into a small circus museum. She had one daughter with her husband, Juan de la Fuente, whom she divorced after twenty years of common life and career. She remarried with a man twenty years her junior, with whom she had another daughter. Every now and then, Pinito del Oro reappeared in public for special circus occasions&mdash;often in company of her good friend, Miss Mara. In 1990, she was awarded the ''Premio Nacional del Circo'' by the Spanish government, and in 1998, she received the ''Medalla de Oro de las Bellas Artes'' for her remarkable contribution to the Spanish circus arts. Pinito del Oro passed away on October 25, 2017 in Las Palmas. She was one of the most iconic stars of the Washington trapeze, on one of the greatest aerialists of the twentieth century. After that, like a matador, Pinito cut off her ponytail. She retired in Las Palmas, where she transformed her house into a small circus museum. She had one daughter with her husband, Juan de la Fuente&mdash;whom she had divorced after twenty years of common life and career. She remarried with a man twenty years her junior, with whom she had another daughter. Every now and then, Pinito del Oro reappeared in public for special circus occasions&mdash;often in company of her good friend, Miss Mara. In 1990, she was awarded the ''Premio Nacional del Circo'' by the Spanish government, and in 1998, she received the ''Medalla de Oro de las Bellas Artes'' for her remarkable contribution to the Spanish circus arts. Pinito del Oro passed away on October 25, 2017 in Las Palmas. She was one of the most iconic stars of the Washington trapeze, on one of the greatest aerialists of the twentieth century.